Today I want to share one of my favorite things. A podcast. I love that I can listen while my hands are busy getting ready or making lunches. 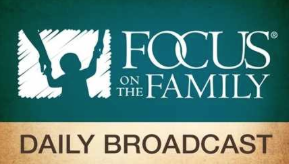 My husband actually introduced me to this program called Focus on the Family a few years ago and I resisted. To my credit when he told me about Focus on the Family he kept telling me about all the episodes that would help me to know how to be a better wife and about the husbands needs and how a wife can help with that. ;) Early in our marriage I was really, really independent and basically really prideful. I think I am doing much better in those two areas but God still has a lot of work to do I'm sure if I was to ask him. So back to this "program". I finally gave in after a few months...still reluctantly. The first episode I listened to wasn't about marriage. I don't remember what it was about but I enjoyed it. So I listened to another and another. Finally, I fessed up to Grant that I had started listening to "his" program and I was enjoying it (seriously so prideful that it was hard to admit!). It took me awhile before I listened to the marriage ones but I eventually did and God did his thing to my heart and melted the pride that was there so that I could actually listen to Grant when he brought the topic up again. Now Focus on the Family Podcasts are apart of my everyday life. Even the topics that I don't think will apply to me will have a little nugget of truth that I needed to hear. I listen when I'm getting ready in the morning or when I'm at my desk or sometimes even in the car. Just give it a try and see what God has to say to you. Even if you don't totally believe in God and the Bible the program will have great things to inspire you in your relationships. So pick up your phone and do it now. Let me know if you take my 30 day challenge or if you already listen regularly. By the way there are plenty of messages to help husbands in the marriage department to! Or if your not married Tuesday's message was "Getting Organized for Christmas" and Wednesday was "Healing the Wounds of War" so there really are messages for everyone.